In Turkey a 5-track cdsingle is released by Pasaj Müsik. It includes Düm Tek Tek and four other songs. (Pasaj Müsik 420611149). The TRT promo is a 1 track cd and dvd in fold out powder compact sleeve with mirror. (pic below) The dvd has lyrics, bio and photos but no videoclip. In the U.K. DTT reached #127. An album release Fast Life is out now, it has the radio version and a new remix of Düm Tek Tek. The Turkish Hadise album Kahraman (Pasaj müsik) is out now. It features Düm Tek Tek, the remix and a new acoustic version of the song. Düm Tek Tek - DJ Szabad remix - 2012 release Belly Dance Music vol. 1. Düm Tek Tek is released in Japan on a 4 track cdsingle (August 5) The cdsingle includes two versions of Düm Tek Tek and two of My Body. The cds is titled Hitonatsu No Dun Teku Teku (ひと夏のドゥン☆テク☆テク) and Hadise is spelled ハディセ. Digital release is available through several outlets. Düm Tek Tek already enters the Tokio hot 100 at # 91, to 53, 40, 48, 36. In the Kiss FM (Kobe) chart Hadise has been #2 and she also charts in other FM Airplay charts. The cdsingle is available at CDJapan (best shipping prices to Europe as far as I know).HMV Japan also sells it internationally. Special thanks to Tom K. for this one. Watch an amazing commercial at Youtube or see a great special at EMI Japan here. The video with Japanese subtitles is here at the EMI Japan Youtube channel. 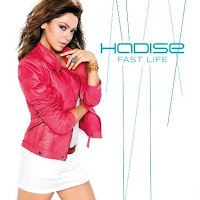 Hadise visited Japan for promotion early September, followed by the Japanese release of the Fast Life CD. (which is re-titled Hadise). The Japanese edition has 14 tracks (extra tracks: My Body & A Good Kiss) and three videos including Düm Tek Tek. Expected on October 7. Hadise performed in New York on the 22nd of may. A special website Hadise New York is lauched. Andriette Norman from South Africa has recorded an Afrikaans version of the song titled Dum Tekk Tekk. It's out on her new CD Dink Aan My which is out on Sony Music South Africa since October 12. Listen to an excerpt here. Shehla Gul from Pakistan has recorded a version in the Sindhi language titled Chup Chup Chup. Watch the video here. Each year several Eurovision entries make it to hits compilation CDs. Quite odd is the choice for Düm Tek Tek on the 3CD De Grootste Barbecue Hits Ooit (The greatest BBQ hits ever) from Belgium. So now you know you can safely do the Düm Tek Tek while roasting your ribs and flipping the burgers.